Unresolved hurts devastate relationships and poison hearts. In his pastoral ministry of more than 25 years, Jeff Wickwire has seen it happen time and again. In Making It Right When You Feel Wronged, he draws on these experiences to lead the reader on a journey of insight and healing. Discussing how offenses occur and the trail of bitterness they leave behind, Wickwire prepares the reader to better understand the model Jesus sets for resolving hurts. He looks at how Bible characters confronted offenses, whether rightly or wrongly, and the consequences they faced. Then he uses Jesus' teachings to lay out clear steps to follow on the path toward freedom that comes only in forgiveness and release. For pastors and church leaders, Wickwire offers priceless insight into dealing with dissension in congregations. Honest and practical, this book has something to offer every Christian who has felt the sting of offense at home, church, or work. - Publisher So you can't quite get over it? Making It Right When You Feel Wronged leads you in an exploration of Bible characters faced with the challenge of dealing with many different offenses.Discover how these people confronted their offenders, the consequences they faced for their actions and what Jesus taught about handling hurts. You will come away with specific steps to follow on the path toward the freedom that comes only in forgiveness, remembering that your future does not depend on what's happened to you, but on how you respond to it.Honest and practical, this book has something to offer every Christian who has felt the sting of offense at home, church, or work. 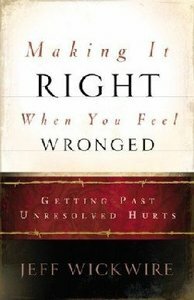 About "Making It Right When You Feel Wronged"
So you can't quite get over it? Making It Right When You Feel Wronged leads you in an exploration of Bible characters faced with the challenge of dealing with many different offenses.Discover how these people confronted their offenders, the consequences they faced for their actions and what Jesus taught about handling hurts. You will come away with specific steps to follow on the path toward the freedom that comes only in forgiveness, remembering that your future does not depend on what's happened to you, but on how you respond to it.Honest and practical, this book has something to offer every Christian who has felt the sting of offense at home, church, or work. Jeff Wickwire is pastor of Turning Point Fellowship in Fort Worth and the founder of three other successful churches. The author of Making It Right When You Feel Wronged and The Windshield Is Bigger Than the Rearview Mirror, he and his wife, Cathy, live in Fort Worth, Texas.